We've all had red eyes at some point in our lives. While there are numerous causes, the condition is a result of swollen or dilated blood vessels on the sclera (the outer white surface of the eye). This condition can be experienced with eye pain, itching, swollen eyes or even blurry vision. In some cases, you don’t feel it at all. Today we’ll look at the common causes of this condition and how to get rid of red eyes once and for all. We’ll explore natural treatments, home remedies, and at what point you should see your eye doctor. 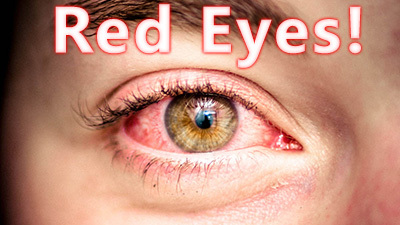 The most common cause of red eyes are allergens and environmental irritants. These include things like pet fur, pollen, dust, or even dry climates and the sun. The issue can also be the result of infections or inflammations. A perfect example is someone who doesn’t properly clean and disinfect their contact lenses. Someone like this could be at risk for red eyes and a possible infection. Your eyes can also become red and irritated through something as simple as staring at the computer screen for too long. Known as Computer Vision Syndrome, this situation arises when using digital screens, as we tend ot blink less and dry our eyes out while using them. Many of the more mild symptoms are common. More intense symptoms like sensitivity to light, discharge, or blurry vision should prompt you to call your eye doctor. Start by taking four metal spoons from your kitchen. Place them in ice water and let them get cold. After that, lay down and placed them with the concave side down over your eyes. The cold will help relax your eyes. Switch them out with fresh ones when they get warm. Do this for about 20 minutes. For this method, as with any other on here, make sure your tools are sanitized so you don’t risk infection. Bring a cup of water to a boil and add a tablespoon of eyebright, chamomile flowers, or crushed fennel seeds. Let is steep for 30 minutes before straining the liquid through a very fine filter. Refrigerate and use it as a rinse on your eyes for instant relief. Using just about any type of tea bag, make your tea first and then place the cool and damp bags over your eyes as you lay down. Depending on the type of tea, it will offer additional soothing benefits. Leaving your makeup on for long periods of time is no good for your skin, but it can also clog your tear ducts and irritate your eyes. The same goes for contacts that are left in for too long. They can cause infections if not removed and cleaned. This idea comes from Stephanie Tourles, specifically her book entitled Organic Body Care Recipes. In the book she recommends combining 2 teaspoons of finely grated cucumber or raw potato, with 1 teaspoon of powdered milk. Using a mortar and pestle, combine the ingredients into a thick paste, adding water if it’s too thick and chill it. Lay down and rub the paste on your closed eyes and eyelids and leave it for ten minutes before rinsing off. For some of us we are tied to a screen as part of our jobs, but anytime you get the chance, step away and take a break from digital screens. During your break time, allow your eyes to focus on varying objects at various distances to relax and reset them. For some of us it’s easier than others, but sleep is one of the best ways to alleviate your red eyes. Not only do your eyes need to recharge, but so do your organs like the heart, thyroids, and kidneys. By taking some ice or a bag of frozen veggies and wrapping them in a cloth or towel, you can create a cold compress to press again your eye. This will help shrink blood vessels and alleviate inflammation. In contrast, a warm compress can be used on red eyes as a result of sleep deprivation. Eye drops can be used sparingly, especially ones labeled as “natural tears." Too much use of these products can make bloodshot eyes worse. You should be drinking at least eight glasses of water per day to keep your body hydrated. The additional fluids will help ward off eye inflammation as well. Cigarette smoke is very bad for irritating your eyes. Stay away from smoking and from secondhand smoke as well. There are multiple types of food that can reduce red eyes. Eating foods with omega-3 fatty acids like salmon, tuna, and flaxseed oil are great for this. Foods high in riboflavin like asparagus, milk, cheese, broccoli, spinach, and yogurt are also great. If your eyes are red as a result of allergic reactions, talk to your doctor about possible antihistamine medicine. We’ve all been wondering how to get rid of red eyes, and as it turns out, there are plenty of easy ways to alleviate the issue. Next time you have bloodshot eyes, come check out this page for all the solutions you could possibly need! Have you struggled with red eyes? What did you do to deal with your red eyes? Any tips you can offer others suffering from red eyes? What are some dry eye remedies?